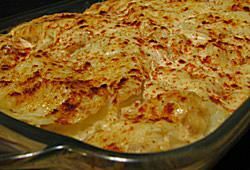 This Hungarian Potato Casserole was served about once a week during my childhood. My father, an Auschwitz survivor who grew up in Hungary, loves potatoes. And this is a very economical dish as it consists primarily of potatoes, onions and sour cream. After a long break I recently started to make it in my own home, and my kids went crazy loving it. 1. In a large pot, heat water until boiling. Add potatoes in their skin. Return to boil. Reduce heat, cover, and cook until a knife can be easily inserted (approximately 35 minutes). Do not cook the potatoes until they are too soft to slice nicely. Drain. Set aside to cool slightly. 2. Chop onion. In a frying pan, heat butter or oil. Saute onion until translucent. Set aside to cool slightly. 3. Preheat oven to 350° Fahrenheit (180° Celsius). 4. Peel and slice potatoes into 1/4 inch slices. In a bowl, mix onion, cream, salt, paprika and pepper. Gently combine the potatoes with the sour cream mixture. 5. In the baking dish, arrange half the potato slices in a layer. If desired, layer hard-boiled eggs slices on top of the potatoes and then yellow cheese on top of the eggs. Then cover with the rest of the potatoes. Sprinkle paprika on top. 6. Bake, uncovered, at 350° Fahrenheit (180° Celsius) for 45 minutes. SERVING SUGGESTION: Serve with baked fish and roasted broccoli or a green salad for a satiating family dinner.